Before I had always sore thumb. In addition to the trigger my thumb slipped permanently what was really painful. The day I tried Inoveli handle my sore thumb almost disappeared, it no longer slips and I have the handlebar hand. I waited for a while an innovation on the throttle after still tried the quick draw I quickly returned to the original trigger. And then a year ago I came across a story: the trigger INOVELI. Everything seemed too good, but was too strong desire to try out so soon, once purchased. I get this trigger in a very neat package is failing to have a paper instruction manual there is a video on the net which helped me a quick installation without worries! Not driven for 6 months, I attack my first race of the championship with the trigger freshly mounted without even trying. And to top it all, I finished my shopping without any pain to the thumb! For me who has very little time to train me, the trigger INOVELI gives me a good boost! 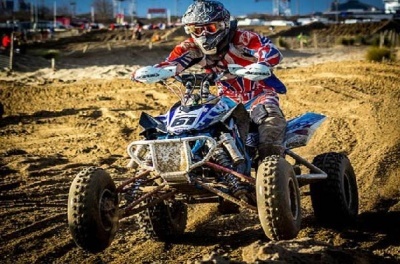 37 / Practice quad for 10 years / Enlisted in the world championship Baja 2013 / Vice endurance duo / Vice-champion cross / Champion racing prairie league LR / 2nd amateur to Kenny Festival / 2nd champion Contest POS / Winner of Morocco BAJA 2012 world championship. I always rolled with the trigger source and had problems with muscle fatigue in the thumb and the handful that both endurance cross. Two months ago, the Co INOVELI gave me the opportunity to try the trigger system. I set the trigger in 40 minutes on my quad with the video posted on the site. The next day I rode on a standard track and endurance in the early laps ease of grip was disconcerting (almost immediate adaptation). In so-called battered (oops, mud, banked etc.) parties. I find that I drove faster and even earned a few seconds a lap!!! why? Is that the morphology of the handles, more suited to the hand that holds the handlebars are much better, allowing better acceleration and a more accurate trajectory. 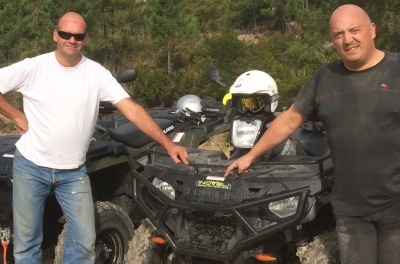 I was able to ride last weekend to test the world's Baja Italy with trigger INOVELI, there were all kinds of tracks, rivers, sand, dirt, mud, gravel tracks and very very fast tracks. Having run in a race situation, confirmed to me that in all these configurations tracks I was much more perform with the original system. Finally, in some portions, I rolled over a 150km / h (taken by the GPS of the organization) and I confirm that holding the handlebars, the trajectory and acceleration at this rate, the system Co INOVELI brings you comfort and safety for driving. So I advise you to try to be able to judge for yourself and make it your own as I did. 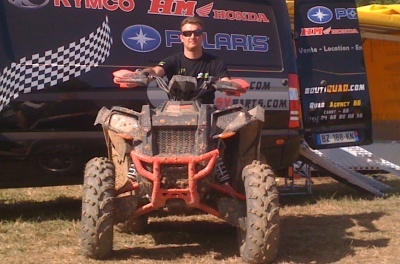 44 Years / Practice quad 7 years / land Endurance League / League quad cross / France championship sand. In the small corrugated iron that are often found on racing sand with my twist grip, I tend to cut because not easy to stay on track with my INOVELI handle, I could not even afford to accelerate so I kept my course well. 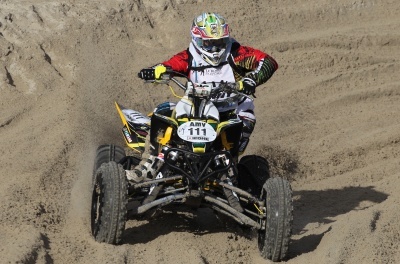 Holes and bumps that form in the sand, go much faster because of the handlebar grip is much better and allows me to shoot at my quad to lift the front wheel. 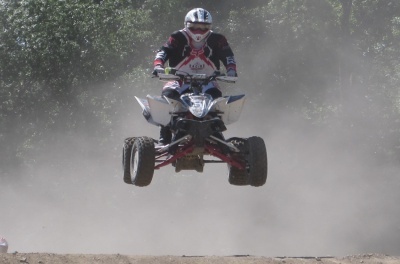 In the banked turns, I can keep the most natural gas net that allows me to go faster and do not ask me in the ruts. Many drivers set before me because the track was very tricky. I did not ask once for the entire race (except in the large cap) because it was very easy for me to change course and very quickly. I have also gained a lot of time. On the line with the beach, bottom 5, I could afford to drop my handlebars with your left hand to drink because the one held in one hand handlebar is easy and safe. The best place on the handlebar can move super fast in the knockout. 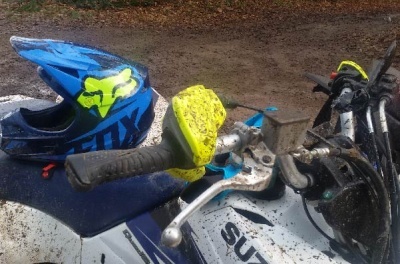 In 2010, I was pretty reluctant to ride with this new system throttle grip especially it was still prototypes at this time. I decided out of curiosity and I was amazed by the ease and speed of handling. In a few seconds I was able to accelerate like I did for years with my throttle grip. Very surprising. In performance I found that I could accelerate earlier in the turn without having to wait for the apex. I could further accelerate harder because I maintained a permanent net result gas. Holding the handlebars excellent especially in difficult terrain and can push and pull on the handlebars when you want. It is easier to place the bike and especially the front wheel especially in ruts. I found that the mix of gas was more accurate and allowed me to better control my rear wheel. An important thing is that it is completely insensitive to shock the stoned. Usually it is difficult to keep the gas in the rocks, holes, bumps. There I kept my gas without worrying about the state of the field. I could also keep the fingers on the brake lever which allowed me to brake earlier and stronger because I wanted better my handlebars. It also has a better handling of the bike because it has an ability to control the handlebars with both hands unlike a rotating handle. 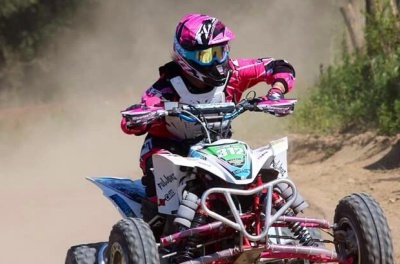 I'm a girl of 19 years old and I practice quad since the age of 7 years. 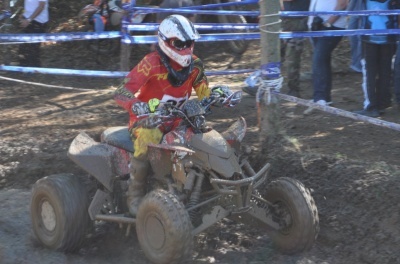 Since only 1 year I drive Yamaha YFZ 450 and participates in endurance League championship Provence. I felt on the INOVELI throttle handle is that it is much more comfortable than the original trigger! I had problems for acceleration because my thumb still slipping, but now I have no worries because I have a good grip on the handle. The handle also facilitates faster because it is more sensitive. The INOVELI handles also safer to my handlebars. I just do endurance Trieves that occurred in a perfect way without any worries of an inch, really nice to ride with these handles. I use the handle INOVELI for about two months on a quad Suzuki LTZ 400. I did the cross bike for several years and I started to quad recently. 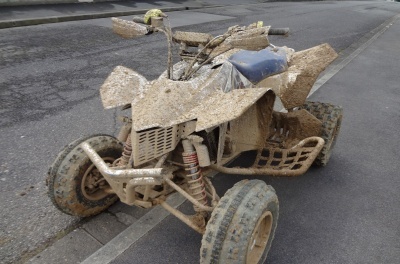 Until now, I used a handful of gas on my quad and I had trouble on rough terrain because after a half-hour situation "dented" I tended to accelerate unintentionally and I much fatigued. Since I installed the INOVELI handle, so good! I do not tired at all. The use is very comfortable and it took me a few minutes to adapt myself. I highly recommend this handful that all ATV users, besides my wife who makes quad with me will also install very quickly. 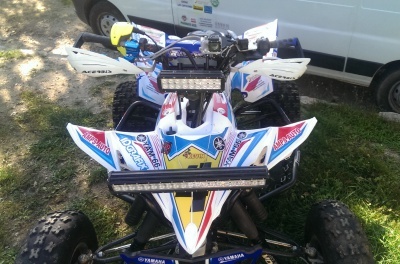 Hello my name is Arnaud Loubiere and with my brother we ride in championship quad cross ufolep and championship of France endurance. It's been two years that both Inoveli handles have been used and that has changed our life. We have all tried rotating handles, original gachettes, extensions of gachettes and we always have them wrist pain where thumbs especially on long endurance of 2 hours. And one day, we bought Inoveli pognets and there it changed our life! More padded acceleration and especially more pains, even in technical parts where there are big jumps we always have a total grip of the handle. In short, to try it is to adopt it. Try it and adopt it! I want to give my testimony regarding INOVELI handle. 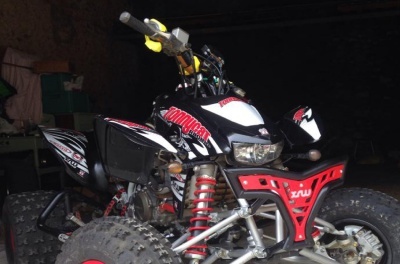 It gave me a different approach to the management of motorized vehicles (Quad and Pit Bike). This INOVELI handle is a revolutionary product! Easy to use and, thanks to its unique concept, gives a better grip of the handlebars and a comfortable ride. 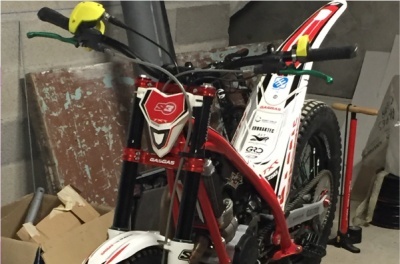 - In Pit Bike, with its judicious positioning trigger, it offers tremendous efficiency on management of gas! She dismissed my clumsiness of tension to put full throttle on orders jump landing. - In Quad, it avoids me fatigue in the forearm with respect to the use of classical trigger that I often ended up pushing with the palm of the hand. My husband and I use the handle INOVELI since its release and we equip all our gear. I always rode the classic trigger because I already thought that the grip (quick draw) causes a lot of stress on the right wrist and thus leads to a lack of control and poor dosing gas. However I had trouble muscle fatigue at the thumb especially in cold weather. When I discovered the invention of INOVELI company I thought immediately that it had to try! For trying to cross and endurance-type training, I think this is the best type of accelerator that can currently be found. I have better control of my gas, my handlebars because when the thumb is accelerated to just closed on the handlebar and ergonomic handles rubbers can well hold the handlebars without tight as strong than conventional handles . (less wasted effort). We drive more relaxed, there is more fluid in the corners and even after running 1:40 I do not feel muscle fatigue. For making the road bike in the past I'd tried this system on a motorcycle because I think that the interest must be equally convincing. I definitely recommend testing this because I think it's really the accelerator of the future for many applications. 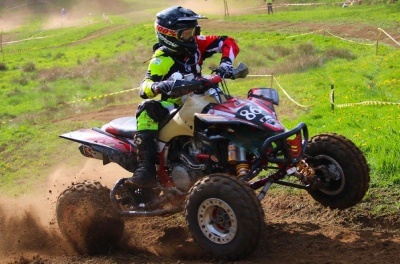 Amateur motorsports since always, I particularly like the bike and quad both for commuting everyday for outputs hiking & sporting events. 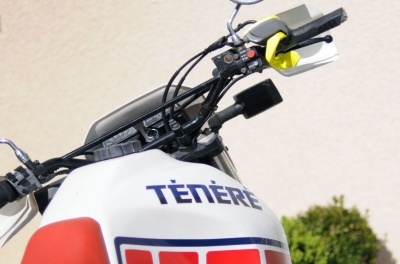 After two big cylindered (R1 & Hornet), it is now on my bike enduro leisure (an old Ténéré 600) I decided to try the famous Inoveli handle for the first time. The installation takes me thirty minutes following the video guide (also very clear and well done) on inoveli.com site, the only "complication" is to manage the tip of the special cable accelerator a little ""the bike (dual cable & tips a little old). Normally you need a cable and a special spring for use on bike, but as my model is too old INOVELI obviously has no plans to develop such accessories for this model. However as I like to try is too large, I tinker the original cable to attach it to the handle. Once the last screw tight, I decided to start the bike for the first trial and the verdict: just out of the ground, I Inoveli manipulates the handle as if I had always had in hand. The grip is firm, the perfect outfit, no particular gene is not noticed. First impressions are confirmed by a little longer on the roads around Lyon campaigns. Accelerations are sensitive, natural and very flexible, particularly in the end times of turn and passes. Being able to leave your fingers on the handle brake without changing the wrist angle is also more than I noticed a rather abrupt braking. Conclusion: A very good product, quality and relatively easy to assemble, I would definitely advise around me! At the start of season 2013, I drove with the trigger of origin, being the solo category 500km tough race for more than 8 hours. With the original trigger, I quickly large thumb pain as well as forearm. I then discovered through another competitor, INOVELI trigger which I could try. I immediately loved the handle! It is easy to mount and through the lock system with pins that can not handle running. The handling is direct and the handle is a real treat on long distance races. It is now two years since I ride with and for the world I will not return to the original trigger! I leave for the 2015 season with the handle INOVELI and advises all users who suffer from pain in the forearm and thumb and want to have a better grip in the hands of the handlebar. 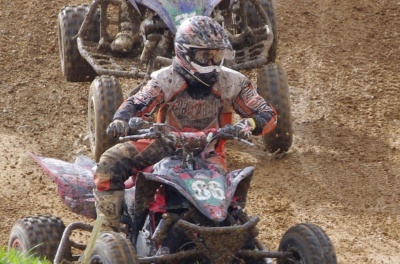 Amateur pilot participating in endurance: THE MOTOR'S, PONT DE VAUX CONTEST, ST Symphorien de MARMAGNE I also used these handles sports touring, I started the quad 3 years ago. I was until today a mixed system rotating spray gun but the efforts given in endurance as these systems are extremely tired so I ordered the INOVELI handles the packaging is top quality and manufacturing information of mounting data INOVELI site is perfect. The grip is immediate I seem to have always had the system, you realize very quickly that keeping the handlebar has nothing to do and can go much faster in the battered and bumps , to have a perfect steering control during cornering and a management not until the gas with my old system. In the fast one is much more serene as the trigger being thoroughly handle is wrapped in an optimal way. Braking is also much faster, no lag time between desceleration and braking. To muscle fatigue level, the perfect fit of the handle allows you to be less tense and therefore much less tiring. So in conclusion this product is recommended strongly. 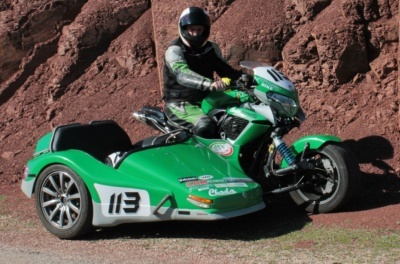 I drive a sidecar rally for 15 years and discovering this new product, I immediately thought it was going to be able to solve the problem of acceleration right turns tight. As physiologically, the fact hips to counter the centrifugal force, plus, having the right arm pressed against the chest when the handlebar fully deflected it virtually impossible to flex the wrist to accelerate hard. So I contacted Federico INOVELI, who kindly loaned me a few to test, while remaining skeptical about the outcome, because the product has not been studied for 3 or 4 cylinders, which require strength more important to raise the butterflies of the fuel rail. But the stakes interested. Having taken a little late on the reassembly of sidecar Benelli, I decided to test the handle INOVELI throttle on my bike Benelli TRE-K to validate the settings and begin to get used to and it will save me time when passing sidecar. It is important to have the drive shaft butterflies the fuel rail, but not free to make additional efforts on the tip of the handle. So I thoroughly cleaned and lubricated shaft bearings. To ease the removal of butterflies, I also moved the attachment points of the three springs about half a turn. The first kilometers, I was surprised by the ease of adaptation. It was as if I had always accelerated like that. It's really strange, like having this hand position, we completely forget the rotational movement of the wrist, despite 38 years of practice 2 and 3 wheels. 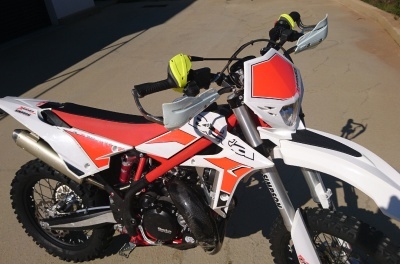 - In winding area does not need to move the wrist, can well support on the handlebars for easy countersteering and the setting angle. - We also just roll all the time with one or two fingers on the brake, which gives a faster response and better support on heavy braking, while managing the throttle to downshift. - I also find that the gear changes on the fly are softer, I feel less smoothly. - The thumb is more sensitive than the rotation of the wrist, so that there is little better calibrate the gas angle and especially in the rain. For cons, I have to improve the throttle cable, a longer, for he has less stress on the shaft for an even softer handle. And still working on easing the lifting of butterflies. The results of the first test is positive for use in multi-cylinder two wheels. Following these initial tests on the bike, I went to the sidecar and there I realized that this is exactly what I needed. I just finally hips properly while keeping perfectly the determination of acceleration in both right and left turn which improves traction and speed out of corners. On June 30th we will participate in the 91th Pikes Peak International Hill Climb in Colorado and on the 20km route turns 156, it will be an opportunity to demonstrate all the good I think this handful of inovante acceleration. Discovering golf cross, it was impossible to drive more than 3 or 4 rounds ... ... I'd ... the paralyzed thumb preventing me accelerate or release the trigger of origin. Then get this trigger and it is day and night, no more pain in the thumb. In summary, I can only advise everyone these handles. To tell you the Inoveli handles or quick draw were my last hope to finally be able to train normally m. I was determined to stop cross training so I always had problems with my thumbs. Well I really enjoyed the early rounds of land with it. Having had a problem (entirely my fault for that matter), I can tell you that Mr. Vellutini the designer is really listening to me and troubleshoot well. They prepare us also very good accessories for handles shortly. Despite the fact that I am a novice in the world of competition, I still wanted to give my testimony . First I want to thank Betty Kraft for making me discover a INOVELI handles the Motor 's, and without that I still do not know even the product today, so thank you Betty . 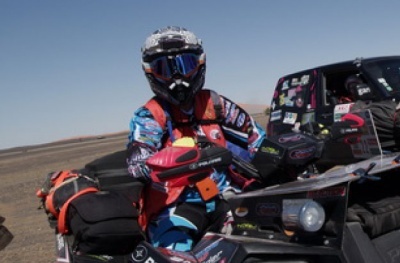 During endurance races , Baja style that lasts 8 to 9 pm, after a few hours of the race I had a big pain in the thumb and forearm because the original trigger . Then I equipped my quad INOVELI the system with the help of the video I put a little time to get the trigger and make adjustments. The difference is amazing, the grip is very fast passages and said saggy happen much faster than before , the shape of the handles is also for many. Now , after several hours of racing, no more pain in the thumb , we move more quickly in very damaged while managing gas with surgical precision parts . It really saves time because it is more focused on the control that the pain is less. With the handles there are metal pins of which come through the handle , which prevents any rotation around the handlebar handles . Try Inoveli handles is undoubtedly adopt ! Today, I do not see myself re-start a Baja without the handles ! Thank you for hosting a INOVELI and easy contact with even the beginner. 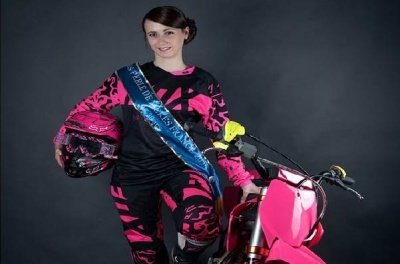 I am currently second in the championship Alsace Lorraine cross NCA and I intend to get the first place. Fifth place in the championship of France Open category in Epinal. I use these grips since the beginning of the season, the grip is nice, when the field is stoned before the less I especially stunned at the thumb, with the traditional trigger in muddy terrain or long sleeved arms arrived a moment thumb slipped trigger, paralyzed, it made me suffer a lot. The shape of the handle fits well in hand, perfect throttle control, I find that the thumb makes a more natural movement and thumb can no longer drag the trigger with the edges perfectly tight pressure washer, mud, etc.. ..
As a result I have changed a lot since last year and handles well have helped me especially on physical endurance. 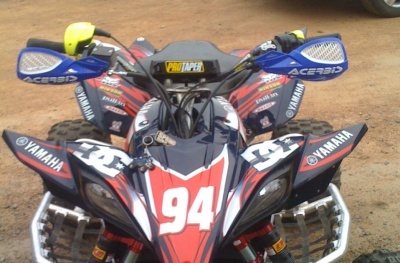 I ride with a Yamaha YFZ 450 and I also fitted my Banshee 350 of these handles. Racing I do a lot of curious people who come up on my quad to test and 2 of my friends have also adopted. Before INOVELI handle, I was struggling to finish the sleeves because I was always sore thumb and forearm! Since I use the INOVELI handles all this is just a bad memory! Also this handle allowed me to ride away much faster because I want much better my handlebars. 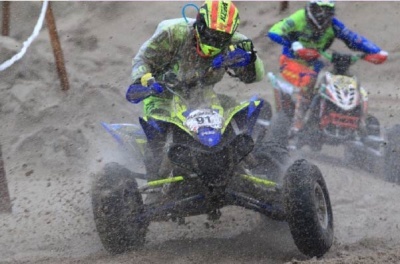 For example, this year I participated in Quaduro Touquet I could finish in 3:30 with much less difficulty and fatigue than last year where I had rolled only 1:40. 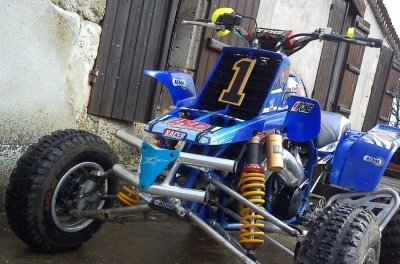 I do the championship of France Road Rally on a Yamaha 250 WRZ. Following a season with pain in the forearms and the tétanisations repeatedly; then a bike accident the following summer with fracture of the right elbow; we had to find a way to get back to as soon as possible to the bike. Indeed, the triceps is a muscle that is very hard to re-educated, and rotation to open the throttle was pretty painful. I had heard of the handle INOVELI, but I had never seen them, nor taken in hand. I take the risk and I start buying them. There is a great discovery for me. First surprise, I put very little time to get used to. When I say used to, it is able to roll into a good rhythm for the race and especially I immediately gained enormously in confidence and performance. To cut gas maneuver taken brakes is much faster, less tiring, more intuitive. It is the same for the overshoot that is more natural and faster. I can also still be on a sliding scale brakes while having already begun the throttle opening. This is an extremely valuable time gained special. These handles have been a great relief in muscle also because I have not had tetanization forearms while it made many years I suffered this problem systematically (enduro). The ergonomics of the handles is really excellent, it helps to securely lock the handlebars. I better control my train before with my ability to tighten evenly both handles. I'll change bikes for next season, and for me it is now inconceivable not mount a INOVELI handle on my new bike! I practiced Quad and now I began to Trial recently. I who have no experience in the world of motorcycling, I wanted to put myself in the trial. 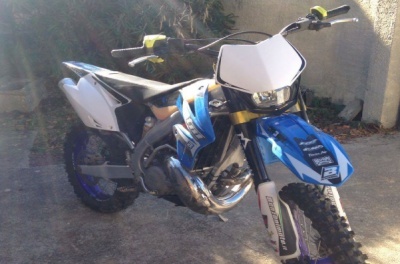 My first bike was a 290 cc Sherco ST 2011. Unfortunately, my first laps were catastrophic! My first impression was "how can it be stable over a saddle without machine while having a handle that turns". A motorcycle lively engine like this is difficult to manage in the technical sections and rutted portions. When you need a precise management of gas, including in technical areas and a good hold of the handlebars in the bumpy areas, the twist grip provoked me several spurts of uncontrolled gas and pain in the forearm which has almost made me go into the background! All these inconveniences caused me apprehension every time I was rolling. Following that, I sold my bike! A few years later, I decided to buy me a trial GasGas TXT 250 which with its rotating handle was even more sharp and violent side engine that Sherco. By cons, for this I decided to equip the handle INOVELI I had known about it in a magazine. Firstly, installation is very smooth, I did not even need to change the cable. It just took me a little adapter and that was it. My first date with my "new" trial INOVELI equipped with handles was very positive. It took me only a small rolling morning to adapt to the INOVELI trigger. I had an impression of driving a new bike !! The gas management had become flexible, incremental and linear (finite jerks). I could finally accelerate without breaking my wrist, which relieved tetany my right forearm. I could cross uphill, make rapid passages in scree firmly holding my handlebars but mostly keeping a finger on the brake. This was impossible with the turning handle, as when the accelerator was on full blast, my hand was too inclined to reach the brake fingertip. Now I do not have any apprehension to go into a hole or take a stone because I know I will never have inadvertent throttle control as was the case before with the rotating original handle. The ergonomics of the handle INOVELI decreased my fatigue at the end of an exit and made me save time on emergency braking because no matter my acceleration, I always keep one finger on the brake. In conclusion, even though I am only a beginner in the trial, I think INOVELI handle allows to acquire excellent stability and perfect control on two wheels. 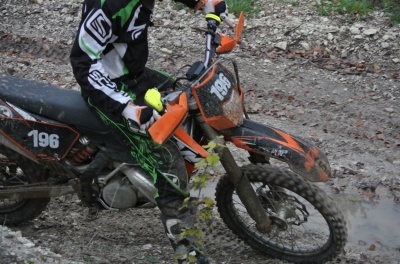 Enduro practicing for 15 years, I have in a while worries mobility right wrist preventing me from playing the sport. I read the INOVELI handle from the beginning. Unconvinced, I crossed not by force of circumstances, and I now realize after 3 rollings, he would not have to wait to be handicapped to get me ... This handle How to say is ... ... it is not explained, it is alive !!!! Difficult to explain exactly the feeling as it is not comparable, new, different, but more effective! This trigger has changed my life ... I have not a single pain forearms ... 100% efficient !!! There is nothing wrong it is the top !!! The forearms are almost always at rest, aligned by hand. Everything is done with the arms and shoulders ... The always perpendicular forearm to the effort ... The balance on the handlebars is perfect. The trigger allows a maximum attack ... while keeping a finger on the front brake which allows for acceleration braking instantly, or even to keep the brake net early in the curve while delivering the gas to well charge forward in the art. It's pure fun !!! It becomes a game to put the little bit of gas to the slightest bump and jump asperity asperity in the plot. The climbs are even easier ... It is so easy to open wide at the bottom, and nothing can make us close the throttle, we hardly time to say ouf, one is already up effortlessly ... without thinking about having to put more and tiring as with a rotating handle. The jerks in the stoned or stones are nonexistent !!!! management of high speeds on the 300 2T finally exploitable ... So manageable that low or midrange !! It is enjoyable !!! In this handful is very fast, but very effective ... it becomes a breeze to pass turns gliding up on the bike. It allows to attack without tiring, the forces are balanced on the handlebars, the front end is more accurate, and you can ride relaxed while keeping the rigidity of the chassis at the supports. Anyway ... as I said ... it lives more than it is explained, it is so different from anything that we know. On a 4T cross / enduro, this handle must be a lethal weapon !!!! 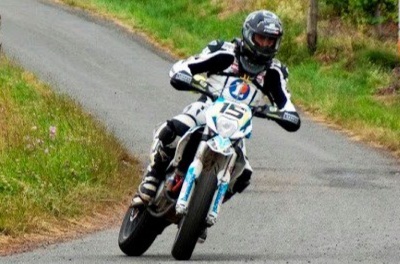 This is Canazzi Thierry (France Road Rally Champion 2013 Sport) who told me about this new system throttle grip. To be honest, at first I thought it was a joke on his part. I rather imagine a typical trigger quad and I do not see how we could use it on a motorcycle! I met the designer Frédéric Vellutini who introduced me to his bike, Aprilia Shiver, equipped with this system throttle grip. From his grip, I realized it was totally different than the quad system. I was interested to make a first dynamic tests while remaining very skeptical about its effectiveness and especially the performance gain that the designer put forward. After the rally of Corsica, I really think the system and I decided to do a test the next day on the Shiver. So I made an appointment with Frédéric Vellutini who kindly lent me the bike for the first grip. I made ia an hour urban driving in the countryside and even one of my special tests to evaluate the system. I was very surprised at the performance of the system but also its ease of handling which is almost immediate. Indeed for a conventional road use, it only takes a minute to understand and master the system. For sports use, I wanted to see on my bike and on my test base to really evaluate the concept. INOVELI has been working on my bike to develop a cable and a spring damper specific gas so that the system works perfectly. I was immediately confident with handles and I could quickly see the benefits they afforded me. 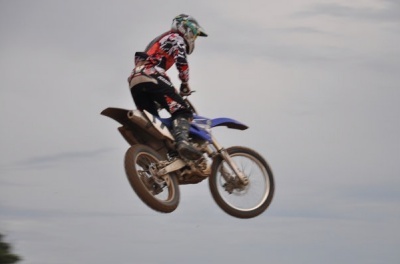 - Braking later because I do not have to return the throttle to tighten the brake lever. - Re-acceleration earlier in the turn and ability to keep the gas in this phase that allows me to stabilize my bike into the turn. - Improved control of acceleration it feels much better in the rain or grip is. Given the awful weather we had all our rallies, it is clear that I really enjoyed the ease of dosing especially in gliding phases. - Better grip the handlebars in the bumpy and fast. - Significant decrease in fatigue usage in particular the break of the wrist that is very detrimental to a rotating handle. At a rally after 10 continuous and intense use of the system, I had no pain in the wrist and forearm that I had before with my throttle grip. This allows me to be much more "fresh" to attack in the night stage. - The ergonomics of the handles is really great. It allows me to keep my good handle and less tiring. With this I can get more precise and better controlled trajectories. It is obvious that the use of handles strongly participated in my last rally results in bringing me a lot of performance and riding comfort (one overall victory, six scratches, four stage wins). I recommend to all pilots to try at least once this system handles to understand the gain they can get. First of all, thank you for allowing me to test the size Inoveli handle on a road rally, 1500 km to the program, sand, pebbles .... all off-road ... a very short field accident where holding the handlebars is important but more importantly, the Gazelles Rally, one roll not necessarily very fast, so you need a very precise determination of gas to cross the stairs stones. Small quick overview, I have very small hands (size 6.5 gloves), child's hands 12 years in fact. I've always struggled with sears jet as quad, my thumb is square where lack of strength and precision, I correctly dose the gas between 20 and 40 minutes and tetany wins the thumb and forearm and there, except on or off, between I have no more precision. 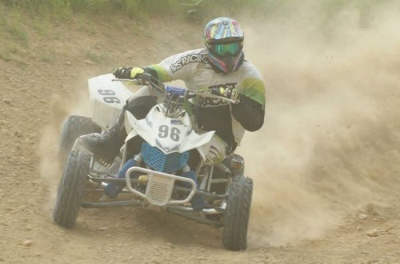 My other fingers hold the handlebars by the end ... well, on my quad Me, I put a throttle necessarily. It takes some learning, it is still surprising to put gas in when you take a big hit on the handlebars in scree or large when mounted on the handlebars is suspended. We can not pay his quad everyone (which can be an advantage too). Shoulders work through especially when you are in this same background and a / 4 turn handle 1. And that's done through reflection and engineering designer of this new trigger. My thumb falls below the handlebars, it is not torn, my other fingers firmly hold all the handlebars and I roll my fingers over bottom are tight like having an identical position to the left hand ... I can finally me cling without putting gas anyhow. The result is a precise dosage of incredible gas, even stoned ground, even at half throttle and even after hours of runs. Time handling this trigger .... about .... a few seconds .... you just take the time to adjust prior to the handlebar according to the driving position (standing or sitting) . I felt no cramp on the forearm or on my thumb., My shoulders are finally balanced. Reliability? no worries and no degradation of its softness and flexibility in 1500 kms with dust. A final positive arch, handlebar grips supplied with the trigger (expanded on the ends) provide excellent grip even in very rich soil, excellent resistance handlebar smashed in, and a good support in the very steep descents, no not rotate. Anyway, I really enjoyed myself throughout this rally with the trigger mainly because it is made completely forgotten and mostly it has been able to do. In control, everything that does not interfere with the driver, allowing it to better manage, to be physically and especially to retain its most effective concentration. I use INOVELI accelerator for the second year and I want to share my experience with this fantastic product. The INOVELI accelerator enables perfect control in all racing situations. It allows highly accurate acceleration in all extreme situations but also input and output curves. The shape of the handles makes it very comfortable handling and greatly helps keep your arms rested. This avoids the famous cramping of the hands and forearms during races. In addition their particular shape allows me not to have no bulbs in the hands whereas before my hands were destroyed by the bulbs. 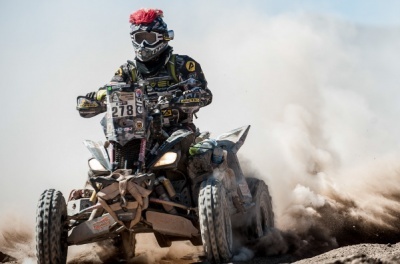 The Dakar is a unique competition of its kind, long and extreme. The distances in the 15 days are over 9000 kilometers of racing with temperatures ranging from 55 ° C to -10 ° C and + 4000m to many peaks. One of the main problems in the Dakar is to have a constant velocity joint (80 kmh - 120KmH Maxi) on hundreds of kilometers every day. Speeds are recorded in our GPS and if exceeded we have sanctions up to disqualification. Keep the average speed is essential and that is what is the strength of the INOVELI handle. It accelerates over long periods of time without fatigue in the wrist or thumb as was unfortunately the case before with conventional accelerators. During the daily special that exceed 500km, we face extreme conditions during which it is also very difficult to maintain a constant speed. With the handle of INOVELI accelerator, this is no longer a problem! It allows for both continuous and perfect dynamic acceleration while providing increased security. Indeed one can go over bumps or holes without fear to a sudden gas or lose control of the handlebars. As best wishes his handlebars, it is much safer and has less to fear the traps of the road . Material quality is another important feature of INOVELI handles. Indeed, all the extreme conditions encountered (temperature, rain, mud, Fesh-Fesh, sun) were never a problem for INOVELI handles. 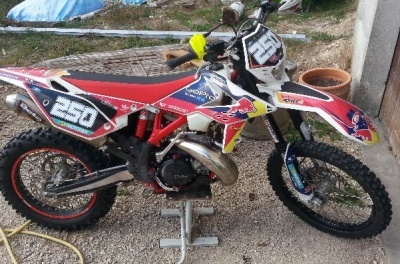 I started the Dakar in January 2015 and I used them without interruption until November 2015 without having to replace any part or even changing grips. For all this, my team and I decided to continue using the INOVELI handles for the next Dakar in 2016. Happens to keep two fingers on the brake while keeping a good maintenance of the handlebar to let the left hand while turning the throttle to pull the roll off. No harm to thumb AT ALL! Before endurance, I finished with the apple of hand speed. In addition to smash gas problem that cut, the more you accelerate the more I like the handlebars. Any questions or concerns inoveli responds super nice. The grip of the handle INOVELI is very easy compared to the original handle that was torture after 20 minutes of use. With the handle INOVELI any more pain and even after a day of quad. I recommend it to all users quad because it will change their life. On ground smashed it was difficult to hold the handlebars and measure correctly the trigger. The day I received the INOVELI handle, I was very eager to try it. Once the installation done here is me trying out all that well on a smashed ground and I realized very quickly that this was going to treat me handle! Everything is natural, given the handlebar bends, determination of acceleration in all situations! After two walks and a very sporty setting for the trigger to offer a lot which allows millimetric adjustment for handles like the trigger, and suddenly it makes you want to try everything. This is the perfect accelerator! After more than eight years of intensive practice quad , a desire for change led me to the bike (KTM 250 exc) always for enduro and cross . I quickly wanted to replace the rotating handle with a trigger quad certainly uncomfortable , but much more reassuring to me. When I learned of the existence of INOVELI handles the concept has convinced me and I quickly installed on my bike . Just tried, and they were adopted ! Finally, a system used to manage precisely the acceleration at all times while having the comfort , a better fit of the handle and direct access to the front brake. That's positive for this innovative product that deserves to be at the sole risk of trying to adopt ! Before I struggled with my bike , now I 'm happy with ! More INOVELI is easily accessible and responsive company that pays particular attention to its customer relations ! Congratulations to INOVELI this product! 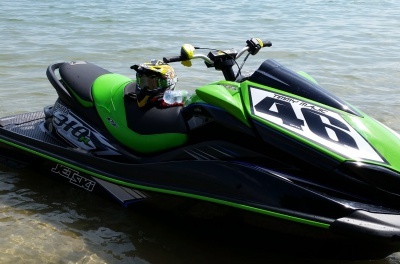 After competing in the UK offshore jetski championships for 3 years I was constantly losing races and potential championships time after time due to a common problem known as arm pump. The long races combined with the trigger action required from my finger caused intolerable arm pump to the point where I would need to almost retire. I tried almost every throttle lever on the market, many pairs of grips and pounds worth of handlebars and nothing helped my final resort was going to be surgery, until one day during an Internet search I found the INOVELI throttle system, I was intrigued by this system and desperate to try it. I emailed Frédéric at INOVELI and the very next morning he responded and asked me to call up for a chat. 3 days later I received my throttle and I was impressed with the whole product from the packaging to the attention to detail of the system. I installed the system which was fairly simple to do but I have to say Frédéric was fantastic and stayed in touch with me through the whole install giving me help with setting the ratio of gear system. Once I fine tuned the resistance of the spring on my throttle body I was extremely pleased with the results. This throttle system gives me far more control of my jetski as now I have full hands on the handlebars, my arms do not get tired and I can corner much more confidently, I am now looking forward to my next race to test this system out fully but so far I feel very confident. I was a little sceptical about this throttle as I wasn't sure about using a thumb control, but you have to actually feel the grasp on the handlebars to understand how well it works, I would recommend this to anyone. As a company the help and support received from Frédéric was fantastic and I have to thank him I don't think I've ever dealt with a more helpful person when trying out a new product, I was even offered my money back if the system didn't work for me which I think is fantastic. Using hiking and enduro. Some competition also like hillclimb on earth and endurance quad. Very good trigger, very ergonomic thanks to this we can better manage our our braking acceleration is better managed. It was not the thumb down as a classic trigger quad. I drove several hours and not once I complained of pain in the thumb and just for that it's great! For rotating handles bike I no longer even want to hear about it! Too dangerous especially quad that is shaken back and forth and left and right kicks accélarateur of parasites and uncontrollable! 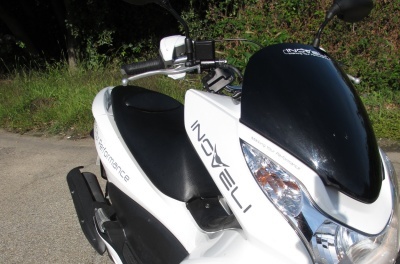 With "INOVELI" was not broken as a motorcycle accelerator wrist is firmly holds our handlebars and manages acceleration and braking in all conditions, launched as prommenade background in large mounted as in large descents that is standing or sitting. In any case thank you for this great invention!! France National Championship Quadcross '11 / Championship Grand Sud / Aquitaine endurance / stamina Midi Pyrénées / MX Trophy / Pont de Vaux quad Contest / which many Tops 5 and top 10 and several podiums last best result a third position at the Cross Country of Madaillan KTM 450 XC to finish the 2012 season in style. My first impression when I opened the package and found the handle was telling me that she is beautiful, but weird compared to our usual sears or twisters. And operate in a vacuum in his hand just puzzled but curious, we wonder if we'll get used to it etc ... Bieeen its weight less than standard systems sears seems to be a definite plus when it comes to research in pure performance and it is certain that here everything was well thought out, so we remain confident! Place the assembly, with lots of small parts, we can understand a little, when in fact thanks to multilingual website and detailed videos website everything becomes a breeze in 20-30 minutes with time everything is done . No game, no abnormal strength, the accelerator seems flexible and docile. 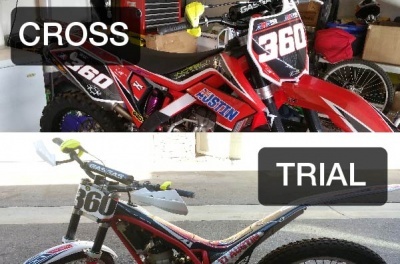 Way to test this system on personal motocross typed with a sequence of jumps and whoops typed supercross. So there, all the worries and doubts fly. In fact it is not absolutely attention to the handle and the way to handle it, everything is ergonomically optimized (provided you have properly adjusted of course) and simplified. I honestly did not feel any discomfort, like I always rode with! From the first round I took my usual pace, accurate determination of acceleration even in the whoops, excellent performance especially in the handlebar brake and smashed through the perfect ergonomic handles, and an ease to put the quad up in the air due to the force which was on the handlebar. Really amazing and it is certain that my thumb better helluva effort, therefore less fatigue. That's positive! What surprises initially it was the most natural position of the thumb with a gesture less tiring. The more you increase the pace and holding the handlebar is accurate and error-free even in sequences of curves or bends. Whoops important in highly technical or parties the right hand holds the handle better and the dosage of gas is much more accurate than traditional trigger. The quality is at the rendezvous and materials such as rubbers are a guarantee of excellent maintains and prevents blisters on hands. We were able to try this new trigger for novice and experienced customers pleasantly surprised by the effectiveness of this new product. I practice this sport for the past 1 year and since I have known the throttle handle from INOVELI, I would not change it for the world! On ground defoncé j always have a good hold of the handlebars and my thumb does not slip of the trigger which provides a comfortable ride to or faster driving and precise. Thanks to the from INOVEL throttle handleI as it is easier to control including gases appeals jumps. I highly recommend this to people looking for a fast improvement. Easy installation with video available on the site. Form of comfortable and well-designed handles. Assay precision and perfect gas assisted by a multitude of possible setting. Finger perfectly leveled against the trigger commonplace. No muscle pain over the long term. Professional stuntman. I do many shows in the US and I also work for Hollywood. I have had the pleasure of testing the INOVELl throttle system. Having tested and utilized in the AMA (American Motorcycle Association) on a Pro level, as well as LIVE Stunt Performances the "INOVELl" Thumb Throttle Control is a piece of artwork. Easily setup for multiple variations of riding from Dirt, Trials, and Street has been a great pleasure to ride for the last 12 months in tests. The saving of the Wrist is a large factor and it clearly helps in the relief of arm pump. The variations of gears for a soft to firm throttle and return is genius. We have used it successfully in the AMA, FIM, and X Games Austin... We look forward to the continued use of the INOVELl in our future race, and stunt performances. I feel the World Market of Riders would benefit from the INOVELl TIC in protection of rider's wrists, and better control of the motorcycles performance. But I see the TTC's greatest asset abilty in almost completely eliminating damage to the wrist, which happens to about 163,000 riders yearly in Amerca costing millions of dollars in Dr.'s, insurance, surgerys and never fully recovering. Great product that mounts in minutes, the handles have a very good ergonomics and grip the trigger is almost immediate! I have no more pain, no thumb or wrist! Acceleration is very accurate even in the bumpy where I used to open or close the gas unintentionally! A return to classic trigger is just unthinkable. 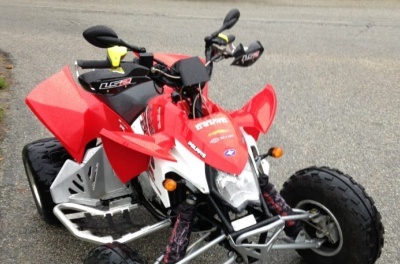 I started with the quad sportsman 500 HO is an excellent machine but requires some grasping. Therefore I sold my 500 for a 850 ho sportsman xps much more comfortable but I always had a problem with the trigger and when I discovered INOVELI grip, I told myself that this was the solution to my thumb problem . When I had mounted the handle has been THE change. I have not at all been hurt thumb ! My thumb is found under the handle , it is torn, my fingers firmly hold the handlebars while I accelerate more and more I squeeze the handle. The grip is very fast and intuitive , acceleration is more accurate than the original sears . The steering becomes easier and therefore more enjoyable. The handles have excellent grip and are more funs . They should be fitted as standard . 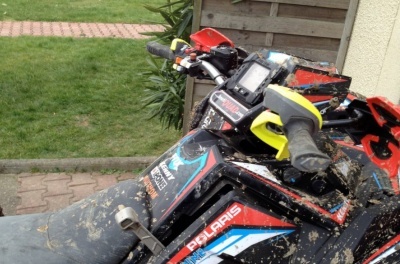 Finally, to conclude, I recommend these handles all ATV riders, just try to adopt it ! A big thank you to Frédéric Vellutini for his invention and responsiveness in our exchanges . 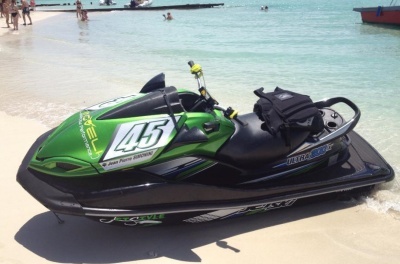 For a long time I knew the product I even tried a prototype quickly once two years ago on a jet ski Bombadier 250 Hp. I had at the time submitted some ideas for improvements for use in competition, but mostly I really wanted to use this system on my jet racing to deliver a true analysis of the performance and not the product even if the product I seemed very interesting. I had the chance to finally try the final version of the handle and I have found it to be totally different from the trial version I tried two years ago. It is clear that much work had been done but I wanted to do a real test on my jet racing before giving a definitive opinion on the actual performance of the product. I first was very amazed at the ease of handling and speed with which I am accustomed to controlling the throttle trigger thumb. I had a real priori on this adaptation because it has been over 25 years since I use my sears jets with the index and I thought it would not hurt me long to find my automation. The acceleration motion with the trigger INOVELI are complete and extremely natural. After 1-2 hours of use, I found that the mix of gas was more accurate than my trigger index. With this system I can navigate the waves background without worrying about putting a shot unwanted gas. Leaving the index on the handle while he was off the front with another trigger allows me much better control of it especially in acceleration phases where I really enjoy finger to close on the handle. Strong ability to accelerate and stick together in hard cornering is a big advantage especially for golf buoy. I also appreciated the handles that are exceptional because very ergonomic. They marry very well the shape of the hand. It takes much better his handlebars and we no longer have the feeling that we can escape during a violent shock. I find that there is less need to shake hands on the handles because of their ergonomic shape and that even with the handles completly wet. Even in tightly clasped my old handles, I could never have this level of support. The side stops are great because they offer exceptional support when cornering and without the need to shake hands. They are evil enough for golf buoys because we really strong grip in the corners and we keep a real control of the jet-ski. I loved the palm support also because it brings comfort keeping in normal use but it is also very useful when receiving jumps because it avoids twisting of the wrist. Atv pilot with a good level. I returned to the enduro recently. I was used to trigger due to my long practice of the quad and I decided to switch to enduro for fun. So it was 10 years that I had not touched motorcycle, so it was not so easy because we had to go back to trigger the turning handle quick draw. So I tried the enduro bike but it's not easy to balance the quick draw. So have put too much gas unwittingly so that we can not control the bike well. Not only does no fun but also it is often fear. 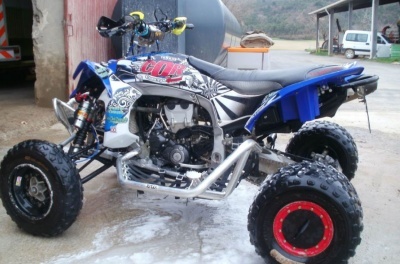 On the quad I had a INOVELI trigger and with the level I had, I thought, why not try to put one on the bike? So I mounted the handle on my TM and it's been an absolute revelation !! Better mix of gases with the coup perfect mastery of the bike. The sore forearm is completely removed. Indeed, before the bike, I was all because I contracted constantly dreading his reactions especially in technical or saggy passages. Soon I had forearms paralyzed what was even more dangerous because I wanted very badly my handlebars. Crossing side, it's just the top exactly as it puts the net gas you want unlike the quick draw which is much less precise and tends to make the bike from nose. Now I have the bike under control, which means that I can accelerate, brake and hold the handle at the same time ... And that is just magical! Another big thank you to INOVELI who gave me the pleasure of riding motorcycles. Enduro amateur pilot. 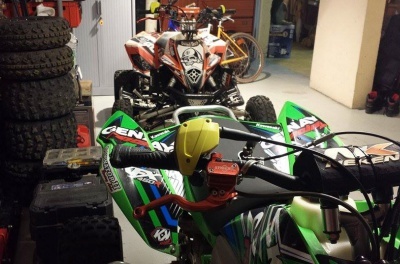 A practicing sport quad for many years before moving to Enduro. I use INOVELI sear for 2 years. I'm originally a Quad user. After many pain felt in the thumb with the use of a universal trigger, I wanted to try the INOVELI handles to solve this problem. I mounted the handles on my KTM 525 XC and I was won over by the concept. 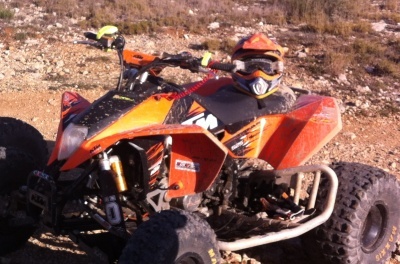 I was used to trigger the classic due to my long practice of the quad and I decided to move to the enduro for fun. The adaptation was a natural from the first output because the system is very intuitive. 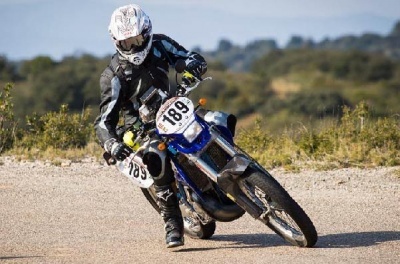 For a little over a year I spent the motorcycle license to practice enduro motorcycle. Being accustomed with the system, I installed the handles on the bike. 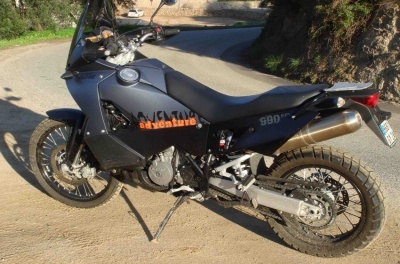 Currently I ride on Husqvarna TE 300 and I'm essentially enduro (stream ascent, crossing, climb). Thanks to this system, the management of the acceleration is more accurate especially on moist soil. Also when you want to pull the handlebars to cross an obstacle (tree, stone ...), it does not twist his wrist to accelerate, and thus strength and stability is gained. the arms are kept in line anywhere in position! This system actually brings a sense of security because you can leave your fingers on the brakes to anticipate braking. In conclusion, I highly recommend this innovation, which to me is a leap forward in improving the safety and efficiency of pilotage. Biker for many years. I participated in many outings with my biker club. I also practice enduro but less regularly. These handles have allowed me to really improve my driving because I want much better the bike with the right hand and I have no need to break the wrist. Adaptation was done in a few kilometers. The system is really intuitive. The bike seemed all the more flexible and precise on. Far fewer jolts to town on that big-twin. Friends who were able to try this handful were also impressed by the simplicity and comfort it provides. In short I highly recommend this accessory, which is for me, a leap forward in improving the comfort and efficiency of driving. I got the handle in a finely crafted packaging. Parcel 48 hours after receiving the order ... bravo ..! The return spring rudder for carburetor KTM 525 was well within the package ... Installation without problems and very marked improvement in the flexibility of the trigger. ..the mounting the handle is made without any problems also on a FLEX handlebar (plenty of room to stay there the other handles, stalks and cut circuit ..). Slight modification of the length of the trigger to facilitate déhanchés rights for pilots who grind their lot in quad and still allow optimal rotation of the trigger with the thumb in any position on the machine. After 1 year of use of our first handle Kawasaki KFX 450, I confirm the reliability of the entire materials used in this handle, both in the hull, gearing, quality, comfort, and wear resistance of the rubber part of the handle (more wear resistant than normal handles ..). On first use, I recall that it is IMPERATIVE to properly fit the retaining pins handles after determination of the final position of the handle on the guidon.2 small holes in the 3 mm diameter handlebar (through the handlebars share in part) help you in the hole using the guides already drilled in the handle, will ensure the complete security of maintaining handlebar grips .. This is not the case of standard handles, glued, clamped with stainless steel wire, which nevertheless manage to move and sometimes downright out and so sometimes cause serious accidents !!! Biker for over 20 years. I use my bike every day and I make many hikes weekend with other bikers. Biker for over 20 years, I was surprised because this handle this takes over very easily. It allows to hold more firmly than a conventional because the handlebars right wrist handle is right, suddenly the paths are much more accurate. A further advantages is the fact that it easily manages its acceleration, while keeping one or two fingers permanently on the brake lever, which is a more true to the attack as in the event of emergency braking . The throttle control is very flexible and easy to measure, but especially INOVELI handle helps keep the cornering light throttle and allow a gradual reacceleration while the MT09 is precisely deemed extremely brutal to overshoot. This handle is suitable for the ride-by-wire without difficulty, parts of the kit are of good quality (axes, gears, cable, etc ..). I drove 7000 km with and I am fully satisfied. Now it's up to you to try it! 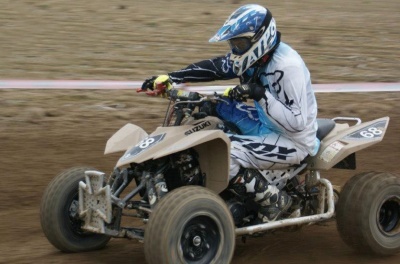 I am currently leading a quad Proto Handy Racing motor bike YZF 450. I practice the competition since only 2 seasons. My discipline is the Championship of France of Endurance on Sand. 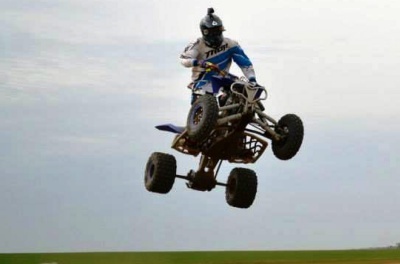 I started practicing with a quad YFZ 450 equipped with the original trigger. I got used to it very quickly. By cons, during training, I quickly realized that at receptions or breaks in the whoops, it was common for me to get sore thumb, by any stretch of the latter !! And what is more, in the paddock, I felt a bit alone even ride with an original trigger !!! We had to quickly find a solution !!! So I did like everyone else and I bought a few quick draw. And what was my feeling by trying !!! ... .. 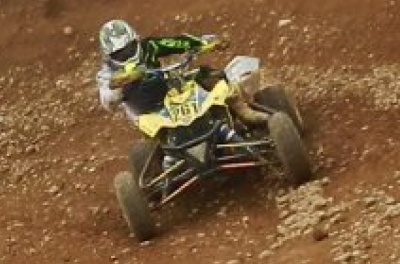 Impossible for me to dose my accelerator in the whoops and no sense of keeping the quad !!! Seeking an urgent solution, so I tried the quad with the latter, and I immediately felt that it was this that I had to because of the flexibility of the trigger and the gesture of inch obvious !!! So I ordered the INOVELLI trigger and have mounted and adjusted to my hand (most important of all !!!!). In the first test, I took the first corner with apprehension, then the second, third, and finally, it was gone !!!! ... .. What happiness !!! And I really enjoyed the flexibility of the trigger because the thumb thrust is greatly reduced !! Since then I roll with this product and I crossed more and more on the races !! For me, this is the ideal, but there is one important thing is to really try with your own settings !!! So here, I guarantee you that I have no advantage to put you ahead of the qualities of this product, and for those who think that this kind of feedback can be fake, do not hesitate to meet me on the paddock for next season, I'll be happy to talk to you live !!! PS: Last thing, I also want to say that when you buy from or to the Service if needed, you will have to do a client listening to true professional and always tries to satisfy you .... Anyway, that was the case for me !!! So good Rides for all and about the upcoming championship !! I practice all these years quad in competition and in many leisure. Being passionate about mechanics and technology, on the lookout for anything that happens on the net about this, I am normally interested dice his first trip the trigger on Inoveli and I understood the revolutionary potential of this product. I acquired at its output in December, the new Polaris Scrambler 850, and I immediately decided to equip the trigger Inoveli. After a few tests I have to say that the grip of the trigger Inoveli is very fast, almost instantaneous grip hands is extraordinary in my opinion, I could ride on the fast parts and stoned, much faster than in I usually with a sense of security because the more you accelerate, the more holding the handlebars is important and I can tell you that the 850 is gaining momentum! The ergonomics of the trigger is no problem in the corners whatsoever. In more technical sections and short report on large crossing the grip was slower for me, but after 30 minutes we go without any problem with a specific dosage gas. After these tests, I can only recommend this set Inoveli even quads fighters to win in comfort, speed and safety, most tendonitis or thumb pain on long distance running. Take a quad with a classic trigger for me against a problem so we gain comfort. To conclude, I can say, "Roll the classic trigger or twist grip, that was before .... "Inoveli this is a great step forward for all vehicles handlebar. I had the opportunity to try the handle prototype INOVELI which I was already very satisfied and then I had to switch back to the traditional trigger before acquiring the FV01 and I must say it was me difficult to regain my bearings on my old trigger as' m used to the FV01. Indeed, in addition to eye-catching design, the grip is almost instantly. The installation is very simple, aided by very good explanations on the site. Even away from the competition to use the FV01 brings enormous benefits to drive with pleasure. I realized the test of an innovative throttle handle very interesting: the INOVELI handle. It allows a better grip of the handlebar grip because the wrist is fixed and the acceleration is due to the second phalanx of the thumb while the first phalanx is allowng the grasping. I made a journey of a hundred miles combining city and highway mountain road, the handling is immediate and pleasant and natural position. The effort required to press the "trigger" is relatively small and easy feeling as the wrist never changes of position. After 1 hour away and different situations I push harder and it happens naturally, I really like to be able to accelerate with a finger on the brake which cancels acceleration-braking-acceleration phases. It is very important for obvious safety reasons to be able to brake immediately in race condition but also on road or during city driving. This new way of understanding the gesture acceleration deserves some attention and most importantly, in my opinion, to be validated in the race at high level. I practice motorcycle without interruption for over 20 years, and about 10 000km journey by years. I rolled V4 and V2, on road and track. These engines have character but the determination of low-energy is sometimes tricky. And especially when forces are exerted on the handlebar ( or bumpy road circuit). The handle Inoveli definitely corrects this problem. Mounting the handle itself is very simple and easy by the many possible settings. In my case , I had to deport the starter control and the cable is connected to the air box . The end result is as I expected. The assay is very accurate count and very stable. On the road, it brings great serenity someting of the state of the road or traffic. The steady speeds are easier to maintain and more accelerations (no rupture of movement) . In addition, the ergonomic handles provide some comfort on long journeys. Track , it is once again the accuracy is improved and large accelerations are easier to manage. Changing the ratio of the system ( for faster printing for example) is very fast. In conclusion : the system handle INOVELI perfectly meets my need . This is a system that is well thought out in all its aspects . I highly recommend it ! I now have a total of 1000 kms of using INOVELI handles mounted on my NUDA with a beautiful train ride to the GP of Catalonia through the Pyrenees (from Toulouse). I could appreciate the command performance in everyday use but also with sports driving. 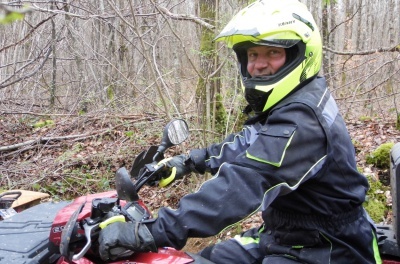 Indeed in the Pyrenees we borrowed from super highways and laces, with other riders who also went to the GP, I pushed the NUDA as I had never been able to before. The road is quite bumpy and particularly closed turns, I was glad to firmly hold the bike with 2 hands under hard braking phases, cornering and on accelerations. Further escalation of the handle INOVELI was more to manage the net gas throughout the phase of the turn and especially when accelerating out. In conclusion, the INOVELI handle fully filled his role on daily trips where one does not feel any numbness, and it is also very significant in attack. I use INOVELI throttle handle for 3 years. 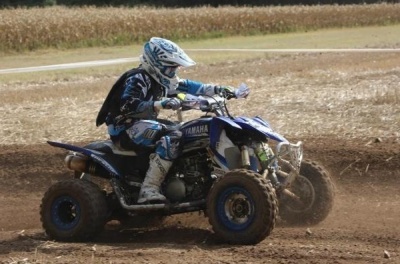 I drive a quad cross in the sand on land and I come from the bike. 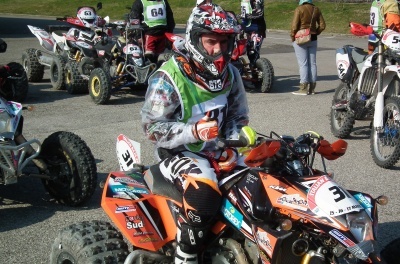 Best places: Enduro du Touquet scratch 37th 2016 / 3rd place in the endurance of Maricourt in March 2015. I use INOVELI trigger for 3 years. 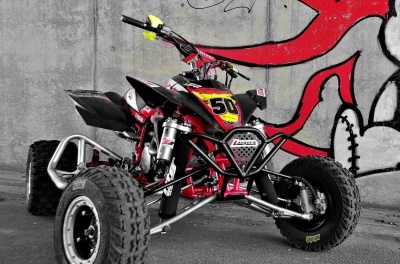 I drive a quad cross in the sand on land and I have the bike. 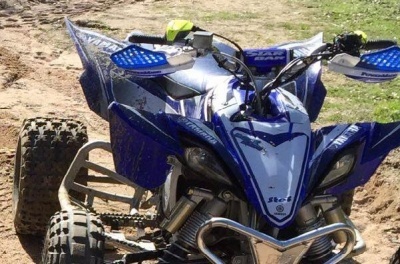 I switched to the twist grip that suited me well enough then I started the sand, and there I had difficulty maintaining the acceleration in the whoops. So I looked for another solution and I fell on INOVELI handle. I spent a lot of time not to find the setting that suited me fine but once it found it really perfect !!!! No pain in the thumb after having eased the throttle spring !!! Perfect mastery of the quad !! Easy to keep accelerating while braking ahead !! INOVELI the handle is very well thought out, strong and reliable. Also a handful of spare kit exists when they are worn and that's great !! Anyway I do not regret and I will not go to a handful or classic trigger. 25 / enthusiast quad / quad Practice for 10 years / 3 years in competition / Currently 3rd in the Aquitaine trophy running on meadow. To retrace my path, I have used for several years in a classic trigger leisure then when I started racing I started to use handle "quick draw" because of pain thumb. After being seduced by the concept of INOVELI system, I made the choice to use this technology in order to find a solution to the discomfort caused by my quick-draw. For my part I mounted the few days before a race, and the assembly is very simple but it takes time to orient and fix the handles for optimal use. From my first use of the system I finished 2nd in the race, I can say that the adaptation time is almost instantaneous which really means the system has a very ergonomic behavior. In a few seconds I was able to accelerate as I do for years but without its drawbacks. It is also an acceleration system that brings undoubtedly gains in braking and thermal safety especially in bumpy parts. To conclude, I suggest you try to be able to judge for yourself and adopt it as I did. Amateur pilot. I make endurance for 1 year. I participate in the Grand Am championship. 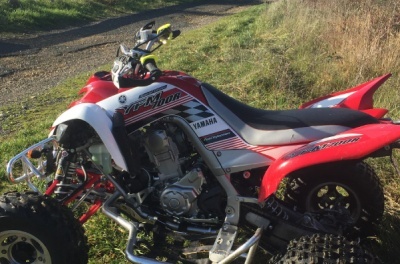 I am 28 and I ride a Yamaha 450 R 2014. With INOVELI my grip, I have no more pain in the forearm. I could run 2:30 without pain in the forearm, something I had with a traditional trigger. In Whoops, I do not put more gas blow without realizing it, as was the case before. It is much easier to manage because its acceleration gas management is just perfect. What a pleasure !!!!! Straight and gas background, holding the handlebars is much easier too! We sign and persists, it is on you like a drug! This is the handle which is integral with the pilot. As the piston with the cylinder! A natural grip, with its ergonomics. Driving accuracy by balancing the clamping forces on the handles! A retention curve and perfect curve. The plus also by holding the handle. And angular locking pin in translation. More handle running or that hard! Happiness and especially the risk of fault less. Having practiced quad cross for more than 20 years (leisure and regional competitions) the principle of the trigger never really disturbed me although sometimes I encountered sharp thumb cramps. At the time the only alternative was the rotating handle, but after a few tests we realized that the machine was unreachable (control of the throttle and steering) I had the impression that my arms forced differently from each other not to mention the cramps in the forearms ... so I continued to use the trigger trying to improve comfort at best with well oiled accelerator cables and by softening the carburetor springs but it was not yet that ! I discovered the handle INOVELI through a friend, and after a quick test we realize the evidence of the operation of this pin. Unlike a quad trigger where you have to push the lever with your thumb in a gesture that is not natural, the INOVELI grip can be used simply by closing the thumb on its hand without any effort, the sensations are good, mastery of the gas is perfect and the maintenance of the handlebar is balanced and safe. The ergonomic handles are comfortable and offer good support especially in downhill and braking. The handle lets you put your index finger on the front brake lever for more responsive braking. We can not do without ! The installation and adjustments are relatively simple and well explained on the INOVELI site. Mr Velutini from INOVELI advised me to replace the carburetor spring with a softer model in order to have a "joystick" feel on the thumb. 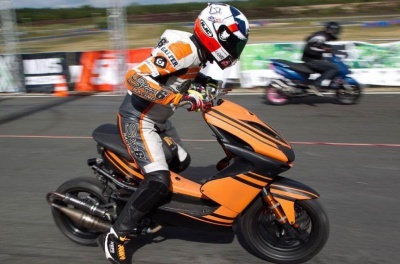 I am part of a scooter association running 50cc scooters and involved in races Run (start-stop 100m, 150m, 200m) and track! We are always looking to win any hundredth to improve our lap ... and searching on the internet I discovered INOVELI throttle handle. I said that our discipline that might be a plus but it must try to check! - The starting position and much more enjoyable because we do not have the stress of breaking the wrist while pressing the front of the machine to prevent it from rising. With INOVELI handle can firmly hold the handlebars while accelerating just with a simple gesture of thumb that a huge plus in Run because it is more comfortable and can rely heavily on the front of the machine to start. - The ergonomic handle is very nice and the trigger. This has really become a natural thing full throttle when the light turns green. - We immediately noticed an improvement in lap times through better reaction time with INOVELI handle compared to classic quick draw! - All the benefits mentioned above namely a better start-off and a good riding position on the scooter is found. - We no longer have any wrist pain because we no longer need to twist the wrist to accelerate. - As the wrist is not twisted, it remains upright on the machine when accelerating which allows a better control of the handlebars and trajectories. - The approach turns, braking and acceleration out of corners are more free because you can keep a light throttle while braking which is a huge advantage. Finally, it is really an innovative handle in the middle of the competition two wheels we only had very positive results. Thank INOVELI for the advice and confidence but mostly I invite all scooter users to try it asap! I am president of the Association of scooter riders of France. For this reason I make throughout the year numerous tests scooters and provided all the information about the world of scooter. The Association of scooterists of France is therefore intended to consolidate scooterists beyond brands and offer members exchange information on scooters, discuss, short to benefit from the shared experience. This is Corsica Ajaccio and more specifically, we could perform a test of the throttle FV01 of Inoveli. This handle is a discovery and testing performed confirms all the merits of the invention Frederick Vellutini. The throttle control is FV01 Inoveli of thumb and in a natural movement since the pressure on the trigger is done from left to right, bringing the thumb toward the palm. This movement allows the driver to grasp the handle with your whole hand, it is the case to say. Gripping the handlebar is well balanced between the two hands. During acceleration, the movement of the handle FV01 also prevents the position of "broken wrist" as is the case with a conventional handle. If the principle is attractive on paper, we need a test on a scooter to realize and realize the importance of this invention. The FV01 handle Inoveli brings innovations. In a conventional handle, and to accelerate due to the rotation of the wrist, the index and middle fingers which are generally used to be braked, should abandon the brake lever to allow this rotation. Conversely, when you have to brake while you were speeding up, we need your hand rotates forward to that you can grab the brake lever. FV01 with the finger "brakemen" remain in place while you accelerate with the thumb. And during the braking phase, the fingers are already in place, the latency to enter the lever no longer exists. Few tenths of a second gained allowing shorter braking distances, naturally. Reminder to 50km / h, a second is 13.88m. When Frederick Vellutini had announced a test on a Honda Pcx, we were far from imagining a Pcx like we drove. With its short stroke, FV01 handle acts as a quick handle. The Pcx is transfigured and delivers an unexpected acceleration. The "wise" Pcx is transformed into a sport than a traditional handle concealed. During maneuvers with a traditional throttle handle when the handle is at a stop, turn the throttle sometimes wonder capabilities contortionist. FV01 with handle, your hand is still in line with the handlebars and as it is only the thumb is on the trigger, you can dose acceleration and fully grasp the handlebars. This new speed takes only a few moments to get his bearings. Accelerate décélérrer the thumb movement is natural and soon becomes apparent. Most stunning of the fingers are still pressing the brake lever. At first, the gesture rotate the hand on the front to catch the lever back, but here too, very quickly, the gesture is considered and, more easily than the hand is already open on the brake lever . We must admit that at first all heavy braking, we pulled the brakes while the thumb was still positron acceleration. Old and new movements are telescoped. After a few minutes of handling, the brain quickly found its brands and new actions are totally assimilated. Ajaccio in traffic or otherwise, the handle of FV01 Inoveli wonders. Combined with new vivacity of Pcx, fit into the movement or release of a congested path becomes a breeze. As you can see from the video available on the website of our association, the hand remains in position. The handlebar is securely gripped and strength is conveniently divided between the two arms. This balance contributes to a smoother ride. 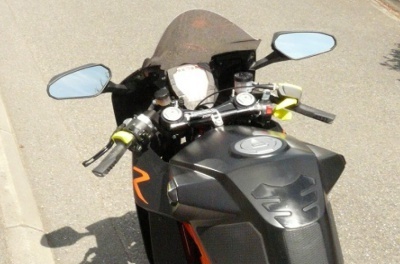 Driving becomes quieter, which may seem paradoxical with the "sporting" nature of Pcx revealed. But it is precisely because the engine responds instantly driving is more fluid and precise. Before driving a scooter equipped to handle FV01 Inoveli, we were seduced by the principle and despite all our imagination, we were far from reality. Driving a scooter equipped with this handle, you realize how the current movement with a traditional handle is forced. The FV01 handle Inoveli can find a natural movement and a new driving pleasure. After the two wheels to three and soon four wheels, with its handle Inoveli finished shoving the design of two-wheeled rotary handle. Evolution or Revolution? To decide, you just try to handle FV01 Inoveli and you will see us as the "R" fits him very well. 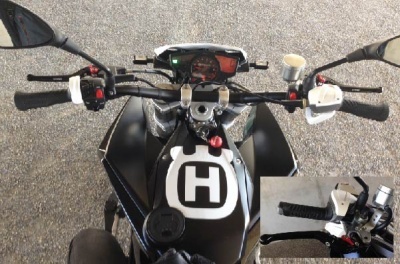 After using the accelerator developed by the company Inoveli on a Husqvarna 610 and Aprilia Shiver 750, it is clear the importance and usefulness of this system. Not only for its fun and easy grip side, but especially for its significant improvement in active safety on the bike. Indeed for the professional that I am specialized in motorcycle training, the most interesting is the foremost road safety. It holds the handlebars better because its handles are better emissions. It is more accurate in these trajectories due to the improved performance of the handlebar. We hold strong to clamp in any position on the bike. The grip is extremely fast instant view, especially much faster than the grip of a rotating handle! There was more delay in braking because with the twist grip must return the handle before the brakes while with Inoveli, it activates the brakes and gas after it rises. This changes everything! Determination of gas very accurate which is very important especially in the wet. User comfort which does almost no focus on the determination of gases and affect the concentration control of the motorcycle. I think this system has any interest to be used and broadly acclaimed as it significantly improves the control of the motorcycle (motor & frame) and participates in an obvious way to ue increase road safety. When I received the Inoveli handle a year ago. 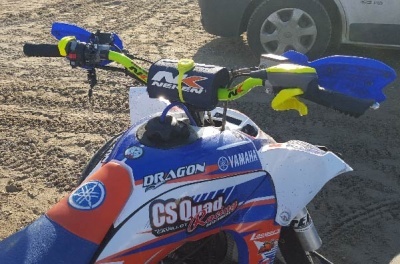 I found that I needed to move the handle angle on the bars a few times, before I was able to get the a position that I liked on riding a motocross track. 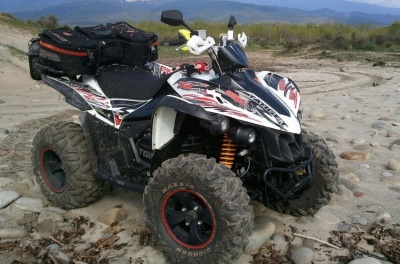 Thereafter I found the system the best on the market for ATV throttles and by far the safest. 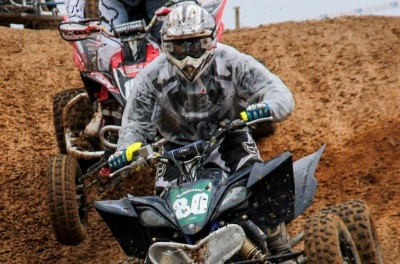 In so-called battered, whoops, rutted areas. I found that I could ride faster and smother, could even earn a few seconds a lap. Where before my thumb slipped on these sections. Re-acceleration is early in the turns and ability to keep the gas on during this phase allows me to get away from others riders or over take before the next turn. 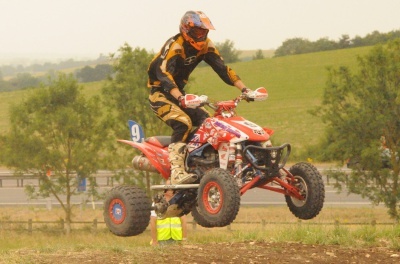 I used throttle on the 3 hour Weston Super mare Beach Race. Using this system I didn’t have any tiredness or fatigue for all 3 hours. Previous years, I have had to use the straight to rest my thumb, due to tiredness on a standard thumb throttle. No fatigue on my thumb or wrist or blister on the knuckles/hand, as this system uses the natural movement of you thumb. Using this system helped me win a championship last year. As prior throttle I lasted 12 minutes before the fatigue in my hand slow me down. This was completely eliminated by the handle. No competition but important use in Stunt for fun! A wonder these handles !!!! There is no other word !! 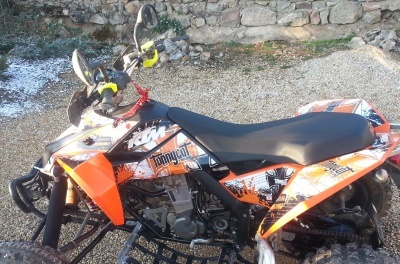 <span title="La seule question que je me pose : " pourquoi="" les="" quads="" n'en="" sont="" pas="" équipés="" de="" série="" ??? ".="" "="">The only question I ask myself: "Why Quads are not equipped as standard ???". 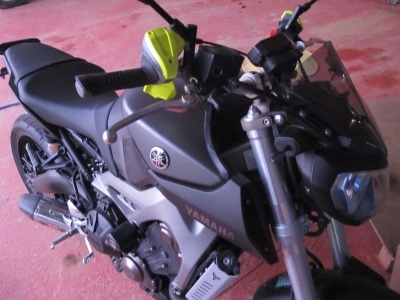 This life-changing trigger me on my Yamaha700 Raptor, which rightly demand a great mix of gases. The grip was very fast, it is as if I had always used. The handles are perfectly suited for the palm of the hand, not the hand loosens the grip. So I have a perfect grip during violent acceleration, turn, crossing. Again thank you also for the spring of the gas component, which indeed plays a big role on the hardness and return the trigger, it is a joy !! Congratulations to INOVELI product that changes my life! In addition, it is very easy to install, no surprises or problems. I said that it is very well studied because for there is no need to make holes or cutouts for putting hands protectors. Congratulations INOVELI, I would not fail to talk about it. 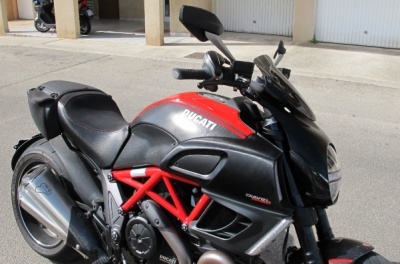 I live in Vaucluse and I motorcyclist for over 30 years. 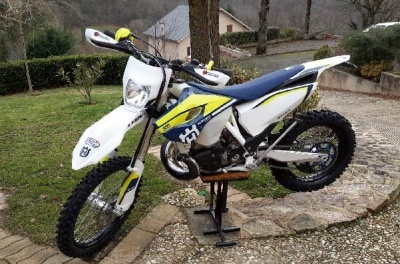 I started enduro ago 10 year Husqvarna, Yamaha and now Sherco. 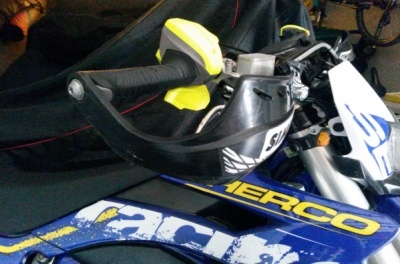 I was about to sell my 300 Sherco R SEF-2014 is a very difficult management of gas that made the bike very difficult to control often see very dangerous. Indeed it constantly generated in significant surges, especially in technical passages when they ask rather a highly accurate determination of gases. Before the sale, I decided to try the INOVELI handle to see if this system could help me. I had to get a special cable and modify components of the gas spring to adjust to the handle and that was it. Surprisingly the grip of the handle was made in a few hours so completely natural. The first pleasant surprise was the total abolition of jerks in the management of gas. I finally found a bike extremely easy to handle with a very linear operation of the engine, much like an electric motor. I also found a greater mastery of the bike in difficult passages (climbs and steep descents with stones, steps, etc ...) thanks to a mix extremely easy and highly precise gas but also thanks to the guidance of the front which is significantly improved. Indeed, as the throttle is fixed, I want the handlebars much better because I can use my hands. This better control of the handlebars allows me to spend in areas battered confidence and therefore much more quickly, which surprised, annoyed to see my friends who for the first time were clueless! Furthermore, suppression of jerks to the acceleration and the permanent rotation of the wrist (to manage the throttle opening) took away the huge muscle pain that I had at the forearm (syndrome lodges). I had even considered surgery to address this issue and find the pleasure of driving. Today it is useless because I can do more than 100 km of highly technical hiking without no pain forearm. I even surprised myself to want to extend its walks whereas before I had trouble finishing. I also really liked the ergonomic grips that is very comfortable and allows the hand to rest while keeping a good grip. The management of the front brake is also much better because I can activate it at any time while controlling gas. In terms of security is a major advance because I can play more easily and naturally with the gas and brakes to control my bike. In purely mechanical level, removing surges in gas fell sharply jerking on the engine and on the secondary transmission (chain kit) certainly reduces wear of the set. On the other hand, I found that the clutch is also much less stress because I no longer have my left hand always open for controlling the clutch in order to "smooth" the engine surges associated with the handle rotating. I do not use the clutch for shifting gears, allowing me to better hold my handlebars and reduce muscle fatigue my left. Finally, to overcome the gas metering problems with their rotating handle, the Sherco has a double mapping to make the engine more flexible in technical areas (soft mode), but you lose half the engine power and consumes more . With INOVELI handle, it is no longer necessary to spend time to switch from one mode to the other depending on the state of the ground because the soft mode is no longer necessary due to a gas management more accurate. We stay on the normal mode and the engine works much better what has increasingly led to a drop in consumption of 1.5l more about 100km (7,5l to 9l). Try INOVELI handle enduro, it is to adopt.